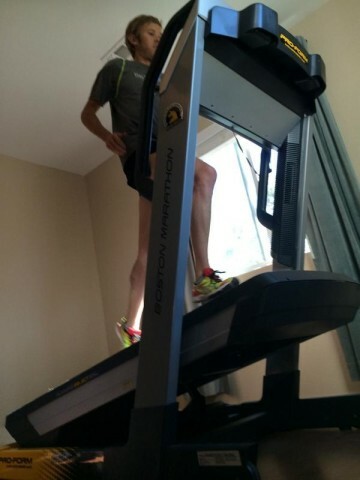 Jack Daniels' Sample Treadmill Hill Workout | Run S.M.A.R.T. Hills are a great way to improve your speed/running economy. They serve the same purpose as 200m or 400m Reps but with added resistance. One downside of doing hill repeats outside is all the impact/stress from running easy back down the hill. A great way to avoid this and mix up your training is to try it on a treadmill. Below is a sample treadmill hill repeat workout that Dr. Daniels loves prescribing for his athletes. Pictured above, you can see Ryan Hall in the middle of a similar workout from Jack! Dr. Jack Daniels: I used to have my college women run 20X30sec at 20% grade and 6MPH, and then take 30 sec recovery between. Just let the treadmill keep running and hop on and off every 30 sec. If 20% and 6MPH is too tough then go to 15% grade at 6 MPH. If 30-sec runs are pretty easy, make it 10X60 sec with 60 sec recoveries. Part 2, Race Kick: Strength Or Speed?